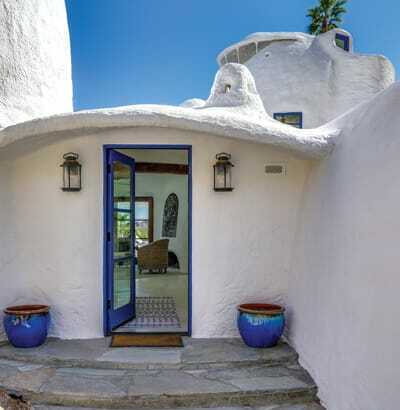 Dreamy memories of a trip to Santorini sparked the purchase of a historic home and its new blue-and-white regalia. This unusual house, which has roused curiosity since the late ’70s, appeared in the “Architectural Anomalies" photo essay in our November 2017 issue. After an 18-month remodel, its new look takes aesthetic cues from the Greek islands. On a hilltop near the crown of The Mesa, a wooden gate slowly opens to a steep drive. At the top, a former candidate for the wrecking ball bakes in the midday sun. In 1977, the eccentricity of this four-bedroom, three-bath house embodied one man’s vision. Now it represents the fulfillment of another’s. The structure, a cluster of mounds and domes, is odd yet stunning. A turret at the far end acts as a lookout tower, gazing over what appears to be conjoined igloos and out across Palm Springs. A breeze picks up and flutters the Greek flag that flies above an Aegean-blue pool. “It came to me in a dream,” says owner Dan Valentino, taking in the home’s chalky white form. Eighteen months have come and gone since he began an intense renovation that is finally complete. The home that languished under a dated veneer of brown shag carpet, disco-era mirrors encircling every room, and cramped lava-rock showers has become a luminous architectural specimen that regularly books photo shoots for women’s designer clothing brands and fragrance lines. 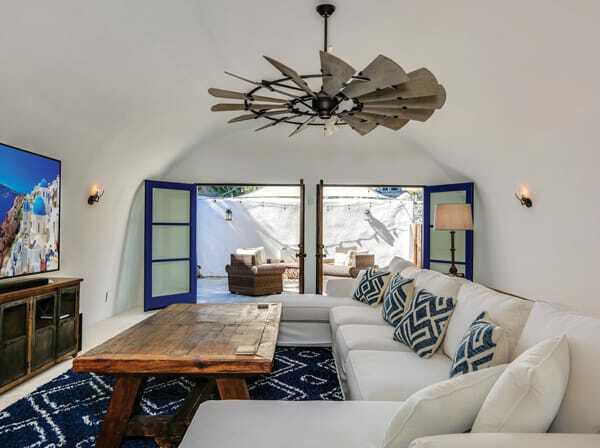 Valentino, a real estate broker and self-taught designer, steps through the blue-framed front door into an airy living space at the center of the home. 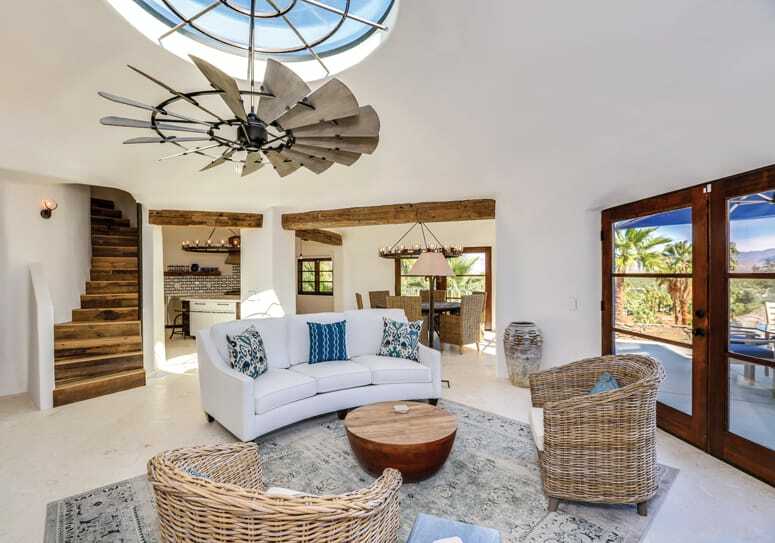 Above his head, a rustic ceiling fan resembling a windmill spins in slow, lazy circles. The kitchen and dining room peek from behind the living area, where barn wood stairs lead to a guest bedroom. Rustic lantern sconces flank the entrance. A towering south wing houses a bedroom and protected deck overlooking the pool. To ensure he wasn’t acting hastily, Valentino toured the Mesa house with friend and general contractor Matt Parker of IE General Engineering. “He looked at it, and he looked at me, and said, ‘Tear it down and start over.’ ” Valentino went home — he lives right across the wash — assuming the house would eventually be purchased and bulldozed. 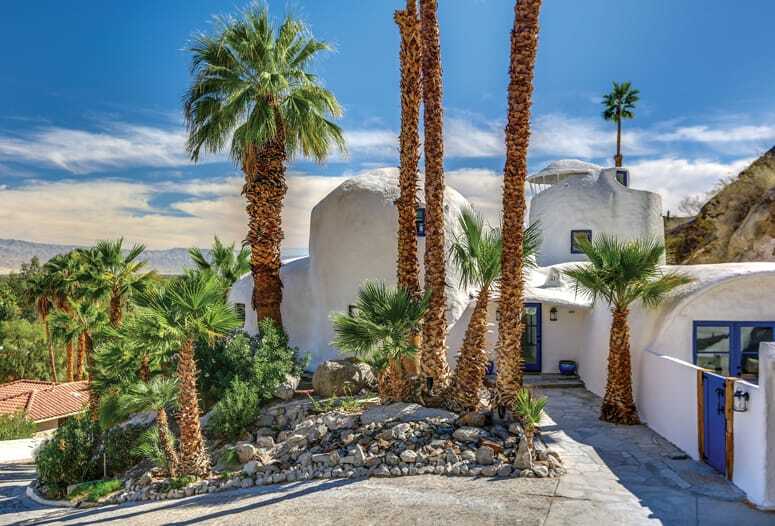 The property, now called Santorini House, is spectacular, just as it must have been 42 years ago upon its original completion in a valley of simple ranch homes and fairway estates that spread their glass walls and patios along the green. Architect William Nicholson chose a spot at the top of a hill and continued to build up, up, up. Passing through French doors that open from the dining room to the free-form pool, one can fully appreciate the way the home claims the land and grants sweeping views from its several levels. An easy set of stairs up the hill reveals a sun deck set amid the natural landscape where an umbrella and lounge chairs await. A steeper stone staircase hugs the home’s south side, winding around a lighthouse-style wing to a secluded bedroom. One more flight up, the mushroom-shaped observation deck rewards climbers with higher vistas. Valentino muses that the covered deck’s open-air design might make for a novel bedroom on a nice night. But Valentino says the home hadn’t aged well. At the time he took ownership, it felt to him like a blend of The Madonna Inn and the 1968 film Barbarella. (Stobert swears Jane Fonda contacted him and asked to rent it.) “It had the look of a cave,” Valentino remarks. “Everything had to go.” And when Valentino says “everything,” he means it. Disrepair and distasteful décor were only part of the problem. Closets were moved for better flow, stairs were rerouted, and a courtyard shed that blocked the mountains was replaced with a fountain. The media room’s wooden coffee table is Valentino’s former dining table; he had the legs cut down to size. A courtyard for conversation off the media room. 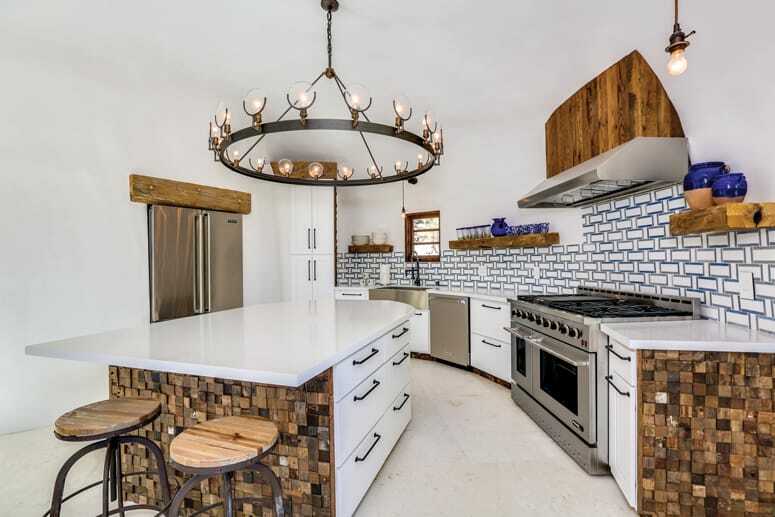 Reclaimed wood accents warm the kitchen; chandelier by Restoration Hardware. “Even the swimming pool had been filled in,” he shares. “The railing was being used for the living room’s sunken conversation pit.” When Valentino leveled off the living room, he wheelbarrowed the fill dirt from the pool into the house, packed it into the pit, and then cemented everything over. Architecturally, Valentino sought to balance the curves and arches that pervaded the home with linear elements and right angles. Porthole-style windows were reworked into squares and framed in reclaimed wood. 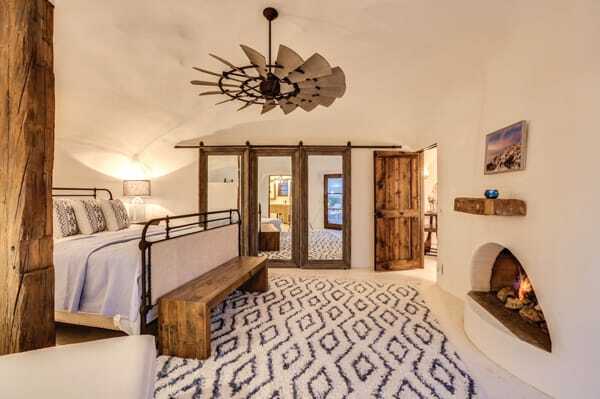 Beams from a barn built a century ago in Pennsylvania were hauled up the steep drive to transform the archways, and salvaged wood from a 120-year-old farmhouse in Ohio was laid across the top of each interior stair. In the master bedroom, leaning floor mirrors fixed to barn-door tracking serve as closet doors. To cover a steel support post, a wood beam cut in half and routed out fits around it. Mirrors slide on tracks in the bathroom to cover the windows when desired, and custom vanities follow the arc of the wall. Throughout the home, that same curvature of the walls presented an ongoing challenge, but nowhere more so than in the kitchen. Every inch required customization to conform to a rounded shape. Blue and white tile made in Greece now defines the fresh-faced culinary space. 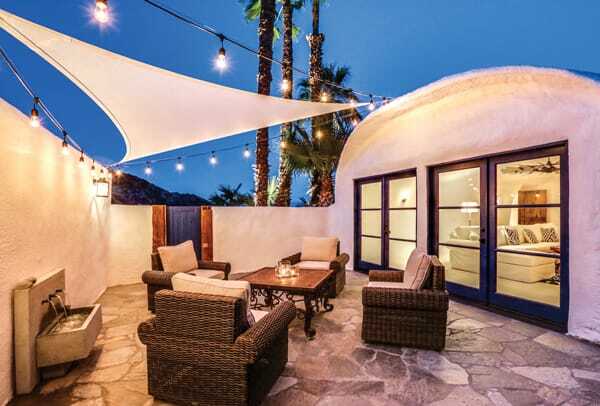 One of the final steps was grinding down the rough stucco that covered the interior walls and plastering them with a soft, smooth coat known as a Santa Barbara finish. The thickness of the walls keeps living areas cool but required Valentino to break through with a jackhammer to route the electric. As dusk settles in, Valentino ignites the 10-foot fire feature beside the pool. A craftsman pulled rocks from the mountain to make it, chiseling them like puzzle pieces then cementing them together; he also created the outdoor dining table by stacking three boulders as a base for a round slice of glass. Valentino saves the house’s “little secret” for last. Behind a narrow bookcase that opens in the entryway, he added a laundry room and wine refrigerator to the formerly empty space. Nicholson’s original plans for the Scooby Doo–style hidden storage area remain a mystery. For 18 months, Valentino oversaw the construction process by day and sourced furnishings, doors, appliances, plumbing fixtures, lighting, and tile online by night. By the time the home was ready to be dressed in its Greek island finery, his garage was packed to the rafters. Aside from photo shoots, he has been keeping the place to himself — and keeping an eye on it from his home across the wash. The curved walls, softly domed ceiling, and half-moon opening of the fireplace in the master bedroom are balanced against the angles of a wooden bench and the trio of floor mirrors that have become sliding closet doors. “Every day people drive up the street to get out and take pictures,” he says. “For some reason, they’re really fascinated with this house. Even Gary said, ‘I can’t tell you the number of times people would just be pounding on my gate and saying, ‘I want to see the house.’ I think because it’s such an oddity, they think they’re entitled to go up and see it.” Now, since Valentino has turned the tides of fate for the home, there’s more to see than ever.